The RECOMMENDATION adopted by the Minneapolis National Convention in 1919, at the time the National Americanism Commission was created, stated that a major objective of the Commission shall be the realization in our Country of the ideal 100 percent Americanism through the development and support of a continuous, constructive educational system destined to accomplish certain enumerated citizenship and Americanism objectives. Throughout the years of its existence, the efforts of the National Americanism Commission have been directed toward that high purpose. Education is the cornerstone upon which the future of this Nation is built. Where there are good schools we find good citizens. In fact, education is the first requisite of good citizenship. 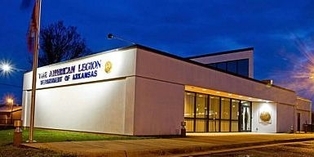 The American Legion wholeheartedly subscribes to the proposition that every educational facility should be provided for the fullest development of the mental resources and technical skills of our people. Over the years, The American Legion at all levels has, through a cooperative working relationship, encouraged its members to keep abreast with the many changes required to maintain a good school system. Support has been provided to secure adequate funds for school construction, research, teacher's salaries and a variety of resources to assist students to continue with their education. are now available to purchase. The red shirt will be offered with a left breast pocket and in a ladies cut without the pocket. These 3-button shirts are a 50/50 blend of cotton and polyester. The State Diamond is embroidered on the right side. Legion Family is stitched on the left side above the pocket and on the left sleeve. Net proceeds from the sale of these shirts support the Department of Arkansas Legion Family programs.